Prithviraj is on cloud nine these days, with the gigantic success of Lucifer. In line with the box office craze, the movie is also repeating same in social media corners as well. That said, the ‘Empuraane..’ song has reached social media spaces and is having an equally exciting time. While speaking about the song and the time of conceiving the song, Prithviraj said that the song was created with a special purpose. Prithviraj added that he wanted the song to be not just something that accompanies the end title card, but wanted it to have a special relevance with the project. It was a song that encompasses the whole theme of the movie that Prithviraj wanted. 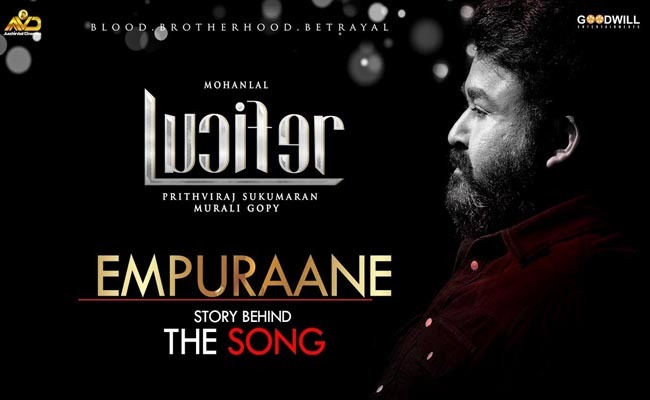 The interview made it clear that both Prithviraj and Murali Gopy shared the same vibe while conceiving the idea of the Lucifer theme song. Since Murali Gopy was the closest one to the story of the project, the job of composing the lyrics finally landed on his shoulders. He also praised the music of Deepak Dev, which gave a whole new mood to the song. Sung by Usha Uthup, the song ‘Empuraane..’ is having a roll in social media spaces now.